Like the tides, courage responds to the rhythm of a force beyond itself. Like the earth, strength germinates never judging growth in itself. Like the air, love surrounds in ever-present accessible connection. Courage defined Bob. As co-founder and president of Support. Education. Togo. he dedicated years of effort to respond to the drive of marginalized Togolese communities to educate their children. As a volunteer with Sleeping Children Around the World, an organization dedicated to ensuring safe, comfortable sleeping conditions for poor children, Bob witnessed remarkable human resilience in southern Togo. Children walked kilometres to sit eight to a desk in outdoor classrooms. 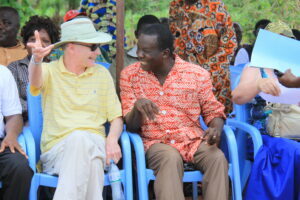 Everywhere people repeated the Togolese proverb “Water is life, but education is the future.” Bob responded to their drive, recognizing his calling to join the Togolese villagers in shaping their children’s future. Strength filled Bob. Throughout Bob’s career in banking, leadership came naturally. His ability to encourage, empower, excite through his own unstinting commitment transferred to his role as president of SET. Quietly and efficiently Bob organized the financial structures of SET giving the organization the base to fund-raise enough to build more than fourteen schools in seven years. 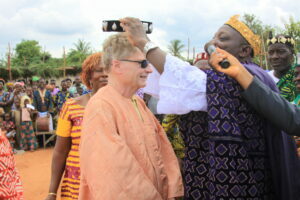 Never one to criticize or judge, Bob inspired SET’s Togo friends so much that in 2014 they made him an honorary lifetime chief of the Yoto District of Togo. 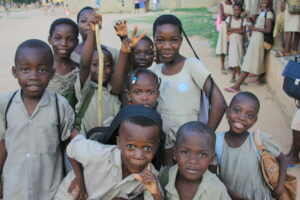 Bob’s continuous concern for the children of Togo gave him calmness and a sense of belonging in a linked world.